245 posts categorized "Mary, Mother of God"
In that single line, the great Doctor anticipated the objections voiced by many Protestants while also explaining the honor and love shown by Catholics (and Eastern Orthodox) for the Theotokos, the Mother of God. I heard and repeated, while growing up in a Protestant home of Fundamentalist persuasion, many of those objections: “Mary was just an ordinary woman,” “Mary was not sinless,” and, of course, “Catholics worship Mary!” People would sometimes go to extremes to avoid any appearance of praise for Mary. A close relative once told me that Mary had merely been a “biological vessel” for the baby Jesus! Two things changed my mind: reading actual Catholic teaching about Mary and re-reading Scripture. The first came from a sense of fairness toward what I didn’t know; the second came from a growing (and hardly characteristic) humility about what I thought I knew. Sure, I had read the opening chapters of the Gospel of Luke many times. But I must have read it dozens of times before I began to slowly comprehend the astonishment of the Annunciation, the wonder of Elizabeth’s ecstatic greeting, the magnitude of the Magnificat. To be blessed is to have found favor with God, to be filled with the grace—the supernatural life—of God. It is to possess the kingdom by belonging to the King (cf. Matt 5:3, 10). As mother of the King of kings, Mary bore the kingdom within her. As mother of the Messiah, she is also the mother of the Church. Pope John Paul II, in Redemptoris Mater (1987), wrote that “in her new motherhood in the Spirit, Mary embraces each and every one in the Church, and embraces each and every one through the Church” (par. 47). Mary and Elizabeth, bearing their sons—one a prophet, the other the Son of God—prefigure the Church that would later be born from the side of the crucified Lord and made manifest on Pentecost (see CCC 766, 1076). Blessed by the Father, impregnated by the power of the Holy Spirit, and filled with the Son, the Virgin brings joy and gladness into the dark, silent womb of man’s deepest longing. Like St. Augustine, John Paul II provided a profound reflection on the belief and faith of Mary. In the expression “Blessed are you who believed,” he wrote, “we can therefore rightly find a kind of ‘key’ which unlocks for us the innermost reality of Mary, whom the angel hailed as ‘full of grace.’ If as ‘full of grace’ she has been eternally present in the mystery of Christ, through faith she became a sharer in that mystery in every extension of her earthly journey” (par. 19). The miracle of Mary’s pregnancy and Virgin birth go hand in hand with the mystery of faith. What was the first thing the apostles saw when they returned from the mount of the Ascension to the upper room? "Together with Mary"—is it only an accident that the Mother of God is mentioned just here, by name, and nowhere else outside the gospels? The Incarnate Word had left us, as silently as he came to us, leaving no trace behind him of his passage through time. No trace? At least, in the person of his blessed Mother, he had bequeathed to us a keepsake, a memory. She was bone of his bone, flesh of his flesh, the new Eve of the new Adam. That body of hers, still part of the material order of things, had housed and suckled God. As long as she lived, there would still be a link, a golden link, between this lower earth and Paradise. As long as she lived; and even if it was God's will that she, Eve's daughter, should undergo the death that was Eve's penalty, the penalty she had never incurred, her mortal remains would still be left with us, an echo from the past, an influence on our lives. The Solemnity of the Assumption, celebrated annually on August 15, presents a golden opportunity to reconsider the person of the Ever-Virgin Mary and her singular mission in the Church. We often contemplate the relationship between Mary and her Son; this reflection will focus on the relationship which Our Lady enjoys with the First Person of the Most Blessed Trinity. Mary has been hailed as the "first-born" daughter of the Father. This reality is evident if one remembers that God--and in a specific way the Father--has created Mary, just as He has created us. She is "one of us" because she is fully human. We are children of the Almighty in a similar vein in which she is His daughter. As we rely on God for our very existence, so, too, does our Immaculate Mother. What do the Father and His sinless daughter share? Venerable Pius IX (1846-1878), in his Apostolic Constitution Ineffabilis Deus (December 8, 1854) in which he once-and-for-all defined the truth of Our Lady's Immaculate Conception, wrote: "To her did the Father will to give His only-begotten Son--the Son Whom, equal to the Father and begotten by Him, the Father loves from His Heart--and to give this Son in such a way that He would be the one and the same common Son of God the Father and of the Blessed Virgin Mary." The Father gave many overwhelming spiritual riches to Mary to strengthen her in her inspiring vocation as the Mother of His Son. Yet, He gave no greater gift than that of the Lord Jesus. Mary, in turn, imitated the Father in raising Jesus from before infancy to manhood. Jesus knew well the best of all gifts which His Mother faithfully imparted: the boundless love of His Beloved Father. Now, as the Son of Mary, Christ came to experience the love of His Mother which was patterned after that of His Father. One may rightly assert that Jesus Christ is the link between the Father and Mary. We often claim that children receive much of their identity from their parents. Eye color, physical build and even disposition are often traced from the child back to its parents. Truly, the offspring rely on their father and mother for multiple and varied things. (And, of course, the Messiah willed to come forth from Mary and be dependent on her and Saint Joseph.) However, the Holy Family of Nazareth is a different case. Mary and her loving husband discovered their purpose in the Divine Child. In Jesus, they found their identity--unto everlasting life! August 9, 1945: Our Lady of Sorrows, Takashi Nagai and "A Song for Nagasaki"
It is often the case that global events are best understood when viewed through the prism of the individual lives caught up in them. 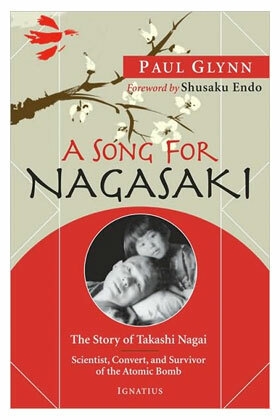 With the coming of the 70th anniversary of the bombing of Nagasaki, the life of Takashi Nagai, as told in Fr. Paul Glynn’s A Song for Nagasaki (Ignatius Press, 2009), does just that, with the events of August 9, 1945—their repercussions, consequences, and even their spiritual meaning—explored in a way that few would have imagined or even dared do. Fr. Glynn is an exceptional writer. He takes the reader—the Western reader, that is—into a world hidden from many of us, namely Japanese society. His book, or rather the subject of his book, is on one level unremarkable. A young man grows up in a traditional bourgeois Japanese home. He is educated and cultured. In due course, he becomes a doctor. Then something quite remarkable commences. There is an inexplicable attraction to Christianity, and it grows. Eventually, the young doctor lodges with a Catholic family in Nagasaki. This city is to be a place of transformation, and in more ways than Nagai could have ever imagined. A Catholic family in Nagasaki was not such a novelty at the time. Catholicism had been brought there by Jesuits in the sixteenth century and had survived, albeit for many centuries underground, through years of suffering, persecutions, torture, martyrdom even—but survive it did. By the 1930s, the city had a Catholic cathedral, with indigenous priests watching over a devout and active community of believers. It was into this world that Nagai entered. The picture painted of this young man is far from flattering. He was typical of young men of his generation and background. Thus it is all the more interesting to read of his encounter with a very different culture within his native land, a culture that could be summed up as both attracting and baffling him in equal measure. At the center of this attraction was not simply an ‘ideal’, such as Shinto or Buddhism could have supplied; instead, he was propelled forward by observing the lives and goodness of those around him living what many Japanese considered a foreign religion. In this encounter his life was changed completely. First, in a very human way, through human love. The woman who became his wife, Midori, was an exceptional person. She was his Catholic landlord’s daughter, and was charming and tender-hearted, beautiful and refined—attributes many of her countrywoman also shared. But she had a quality different from most. This other ‘quality’, however, is something only glimpsed by ‘eyes that can see’. It was piety, certainly, but it was more than that; it was holiness. Unknowingly, Nagai was being drawn to this as much as to any of her other qualities. Theirs was not to be simply a union of bodies and minds, or even wills; it was instead two souls that found each other, and then walked a spiritual path together, one that for all eternity had been mapped out for just these two. In short, it is what constitutes a Christian marriage. The book, like the life of its subject, is shaped around the events of August 9, 1945. Dante and Beatrice, by Carl Friederich Oesterley (19th c.). Sometime this month back in 1265, exactly 750 years ago, the World’s Second Greatest Poet was born in Florence, Dante Alighieri. Not many realize that Popes Benedict XV and Paul VI issued official Vatican statements lauding Dante for the unmatchable beauty of his poetry, his Divine Comedy above all. This is a “comedy” because, beginning in tragedy, it ends victorious (versus a “tragedy,” like Oedipus Rex, which begins in triumph and ends in catastrophe). But what makes Dante so great and so appreciated almost a millennium later? Dante wrote in a very pivotal time for the history of Europe and the history of the Church. His much-loved metropolis of Florence was divided over the amount of control the Papal States should have over Tuscany. Dante began as a soldier and was successively made a member of all the right guilds, a city councilman, and eventually a member of the Council of the Hundred (which was responsible for the city’s highest financial and civic decisions), as well as a Florentine ambassador to other major Italian-speaking cities. Dante never wavered from his disdain over the machinating and malicious Pope Boniface VIII (1294-1303). In fact, Boniface is immortalized in the eighth circle of Dante’s hell among the simoniacs and other ecclesiastics who used their sacred office to attain personal gain. Yet, what is deeper in Dante than his political intrigue is his unique theological appreciation for the role Christians have in uniting others to Christ. While Dante is an orthodox Catholic thinker on every level, he exhibits a rare and unguarded insight that the divine comes to humans not only through others but even as other humans. The mystery of the annunciation to Mary is not just a mystery of silence.It is above and beyond all that a mystery of grace. We feel compelled to ask ourselves: Why did Christ really want to be born of a virgin? It was certainly possible for him to have been born of a normal marriage. That would not have affected his divine Sonship, which was not dependent on his virgin birth and could equally well have been combined with another kind of birth. There is no question here of a downgrading of marriage or of the marriage relationship; nor is it a question of better safeguarding the divine Sonship. Why then? We find the answer when we open the Old Testament and see that the mystery of Mary is prepared for at every important stage in salvation history. It begins with Sarah, the mother of Isaac, who had been barren, but when she was well on in years and had lost the power of giving life, became, by the power of God, the mother of Isaac and so of the chosen people. The process continues with Anna, the mother of Samuel, who was likewise barren, but eventually gave birth; with the mother of Samson, or again with Elizabeth, the mother of John the Baptizer. The meaning of all these events is the same: that salvation comes, not from human beings and their powers, but solely from God—from an act of his grace. The publication of this serious, even profound study of a person intimately joined to the life of the Messiah and written by one of the most respected figures in our contemporary Catholic scene should cause serious attention to be paid to the often neglected figure of Saint Joseph. Father Marie-Dominique Philippe, O.P., an important French theologian who died only in 2006, was a man whose thought was of great influence and depth. 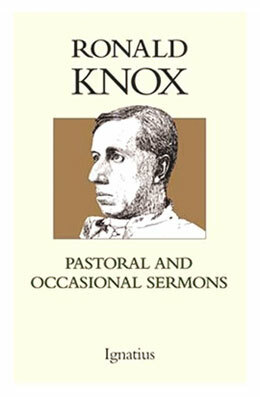 He was also a man greatly devoted to the Church who founded the Community of Saint John. This new community is now recognized in several countries as a very successful attempt to restore a vibrant spirituality to the religious life, which in many places has seemed moribund for years. The Brothers and Sisters of Saint John are a cause of hope to those who look ahead to the restoration of the authentic and powerful traditions of the religious life that have gotten lost in recent times. The Franciscan Friars and Sisters of the Renewal have welcomed them with joy. Father Philippe's book on Saint Joseph is very consistent with the new biblical theology called for by Pope Benedict XVI. 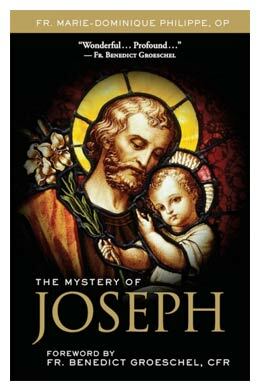 The author very impressively examines the sparse facts that we have concerning the life of Saint Joseph, teasing from them material that connects easily and well with a very impressive structure of theological teaching. This then becomes a means of providing a firm foundation for devotion to the Foster Father and Guardian of the Son of God. Except for Christ and Saint Paul, New Testament figures attract little attention from the secular world and especially the secular media – even when they are in a kindly mood. Occasionally a small amount of attention is shown to the figure of the Blessed Mother but rarely is Saint Joseph or any of the Apostles mentioned. Even in cities named Saint Joseph or San José are the inhabitants really conscious of the fact that their hometown is actually named for a person – a person who played a role of immense importance in God's plan of redemption for humankind. This apparent obscurity finds at its root a kind of Protestantism that is focused intensely on the figure Christ and on the writings of Saint Paul, but which seems barely acquainted with Saint Joseph and even the Mother of God, herself. Catholic theology, which takes a less constricted view of such things, opened up a world of devotion to Saint Joseph the humble carpenter of Nazareth as well as to the Mother of God. How could it be otherwise? These are the figures who stood at the manger on the first Christmas; they are the ones to whom the care of the Word Incarnate was entrusted by God. Mary’s presentation of her Son to the wise men was another demonstration of her mysterious and maternal role in salvation history. It was mysterious—not magical—because Mary, sinless from conception by the power of the Holy Spirit, conceived the sinless Son of God by the power of the Holy Spirit. Her faith is that of a disciple—but not just any disciple, for she is the first and perfect disciple of her Lord. Her role, then, is truly maternal, for she is both mother of the Incarnate Word, Jesus Christ, but also mother of the Church, the mystical body of Christ. Mary, although not divine by nature, is at the heart of the culmination of divine revelation: the coming of God in the flesh. And so the Solemnity of the Epiphany is a celebration of the epiphaneia—that revelation and manifestation—of God become man, Jesus the Christ. The feast, going back to the early centuries of the Church, has focused on three key events, related to one another by virtue of being revelatory in nature: the visitation of the Magi, the baptism of Jesus in the Jordan, and the turning of water into wine at the wedding feast of Cana. Each manifests the astounding, transforming truth of the Incarnation. Each, in turn, opens up further the mystery of God and calls us to worship and adore the Messiah. Consider that Mary and Joseph did not have to receive the magi. We also recognize that Mary did not have to accept God’s invitation to be the mother of the Savior, nor did Joseph, the foster father of Christ, have to obey the directives given to him by angels. Mary and Joseph were not stock characters or tools used by an impersonal force, but real people who accepted the call and the word of God with free will and full faith. Then, in turn, they opened up their hearts and home to those seeking the Word who is the way, the truth, and the life. The magi represent those who earnestly desire the fullness of truth and who yearn to see the face of God. I am struck again by how Matthew’s account presents, so simply but powerfully, the four actions or responses of the magi. First, they were filled with joy upon recognizing the star and being brought to the home of the Christ child. Secondly, they entered into His home and into communion with Him and His Mother. Third, they worshipped Him. And, finally, they offered Him the finest gifts they possessed. The readings from the prophet Isaiah and from Saint Paul to the Ephesians draw out this fact about the magi: they were not Jews. The Kingdom of God is offered to and includes peoples from all nations; it is not for a people united by ethnicity or geography, but by grace and the fullness of revelation. Thus, the magi represent the first of a vast number of Gentiles brought into the family of God through the Christ-child, who is the King of the Jews and the King of kings. And Mary, the true Seat of Wisdom and true Mother of the King, continues to open the doors to her Son so we can see him, know him, and worship him. The family today, in so many ways, is under scrutiny and even under attack. Some of the questions are about the very nature of this most ancient and central institution: What is a “family”? What is necessary for a family to exist? For what purpose do families exist? And how is God going about the business of saving us? “He calls together all men, scattered and divided by sin, into the unity of his family, the Church.” This is why the Son, the second Person of the Trinity, became man. This is why the Holy Spirit, through the sacraments, makes us God's “adopted children and thus heirs of his blessed life” (CCC, 1). God became a man and a member of a specific family so that all men and women might be able to become members of the supernaturally-constituted family of God, the Church. This means that each Christian family is a reflection of an eternal mystery, for it is “a communion of persons, a sign and image of the communion of the Father and the Son in the Holy Spirit” (CCC, 2205). This is heady stuff, no doubt. Which is one reason the reality of the Holy Family is so important, for it reveals how true theology is lived out in true charity, in the daily work and rhythm of family life. Thus, the exhortation from Sirach: “Whoever honors his father atones for sins, and preserves himself from them.” And similar words of wisdom from the Apostle Paul: “And whatever you do, in word or in deed, do everything in the name of the Lord Jesus, giving thanks to God the Father through him.” Wives are to acknowledge the proper leadership of their husbands; husbands are to truly love their wives; children are to be obedient and respectful. This is not about simply following “the rules,” but about giving oneself to others in selfless love, for it was the overflow of God's selfless love that brought about creation. This means recognizing the dignity and worth of others, while also recognizing our proper relationship with one another. Benedict noted that today there is a serious crisis when it comes to “the human capacity to make a commitment,” the sort of commitments essential to true family life. The Son committed himself to the work of the Father and was born of Mary the Virgin. Mary committed herself to the word of God, trusting completely in the divine plan. Joseph committed himself to Mary and Jesus, obeying God despite the efforts it required. And Jesus, on the Cross, cried out, “Father, into your hands I commend my spirit” (Lk 23:46). Christ was willing to die for a lost family, bringing into being a new family, in which we can become authentically human.